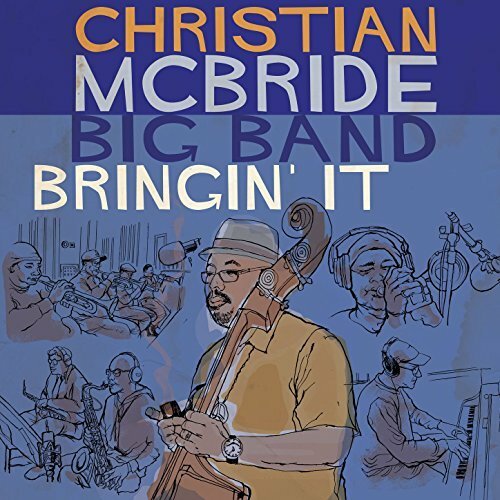 Bassist Christian McBride—known for his association with performers such as Chick Corea, Freddie Hubbard, Joshua Redman, and Brad Mehldau—presents Bringin’ It, the second album of the Christian McBride Big Band. On this project not only do we hear influences by Freddie Hubbard (“Thermo”), Maria Schneider (“I Thought About You”), and McCoy Tyner (“Sahara”), but McBride’s compositional style displays his expertise with jazz, funk, Latin jazz, and gospel music as he effortlessly blends these genres. 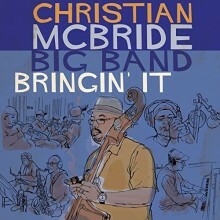 Included on this album are two arrangements by other musicians—Norman Simmons’ “Upside Down” and trombonist Steve Davis’s “Optimism” —which complement McBride’s compositions and arrangements. Apart from the outstanding writing, the musicality and professionalism of McBride and the members of his ensemble are also on display. Each track presents the listener with different periods of jazz and references the composers and musicians of those eras. What’s even more astounding is the way each soloist constructs their solos within the styles of the composition. For example, pianist Xavier Davis imitates McCoy Tyner’s pentatonic and quartal vocabulary on “Sahara,” while guitarist Rodney Jones’s usage of octaves on “Full House” is reminiscent of Wes Montgomery’s style of playing. Vocalist Melissa Walker adds a pleasant and exciting element with her warm tone and melodic embellishments that are light, expressive, and blend perfectly with the ensemble. “Getting’ To It,” featuring a funky bass line over a bed of calypso rhythm, is certainly a song worth mentioning. Drummer Quincy Phillips adds another layer to this already amazing piece. Alternating between funk and calypso rhythmic patterns, he incorporates hits from the arrangement into his drum groove, complementing the rhythmic patterns in the horn section. Another highlight is “Used ‘Ta Could,” which takes us to church with tambourine and handclaps in the opening bars. This composition embodies performative elements of both the blues and traditional gospel music that inspire the listener to join in with clapping and foot-stomping. The blues riff played in the piano and bass, before every repetition of the melody, prepares the listener for the call-and-response conversation between the trumpets, trombones, and saxes. Later on, we hear this exchange of commentary between horns and piano, further highlighting the importance of gospel music and blues in the big band tradition. While Christian McBride has fewer solos on this album, his role is certainly not diminished. McBride’s musicality is displayed in the foundational support he provides for his ensemble. His execution is always on point, and his tone gives the ensemble that “phat” fuller sound that is expected of any jazz bassist. McBride’s playing blends so well that his bass does not distract from the overall sound of the ensemble. That is a true sign of professionalism and maturity. Bringin’ It keeps the big band tradition alive, providing a historical overview of the tradition from McBride’s perspective, while presenting new avenues for further exploration in the 21st century. The album is definitely a must buy—you will not be disappointed. This entry was posted in Jazz and tagged 2017, 2017 releases, Bringin' It, CD review, Christian McBride Big Band, funk, Gospel, Jamaal Baptiste, Jazz, Latin jazz, Mack Avenue, music review by aaamc. Bookmark the permalink.